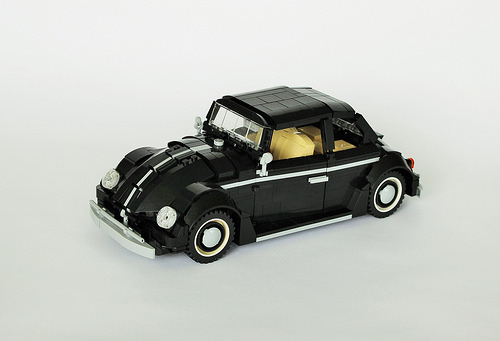 Lennart C is no stranger to the pages of The Brothers Brick and returns with another iconic vehicle, the Volkswagen Beetle Type 1! While the Beetle may have been knocked off the best-selling charts by the ubiquitous, evolving Toyota Corolla, the world’s longtime “Most Popular Automobile” can live on in our hearts with this stunning, slick black edition. The model boasts some really great features for being such a compact creation, including working doors and engine lid, and teeny tiny foot pedals. Printed pieces from the official 10252 Beetle are smartly placed, and I’m pretty sure the seats have some degree of reclining action. Lennart is also already putting newer pieces to good use: the new 1×2 plate rounded with open studs is tucked away in the tail lights. 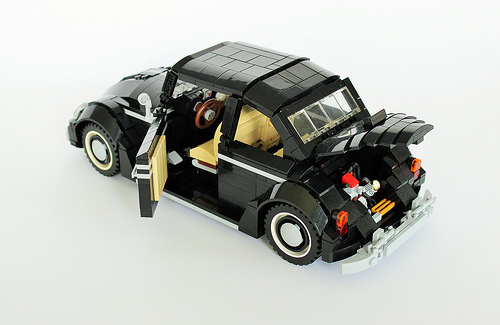 If you like this Beetle, check out more Volkswagen action in our archives!